Something about ancient Egypt sets people’s curiosity alight, making them wonder about its temples and kings, its writing and history. Ever since the proverbial sightseers from classical Greece, writing tourist graffiti on monuments already ancient in 500 B.C., the great pyramids by the Nile have been attracting both travelers and outlandish speculation. 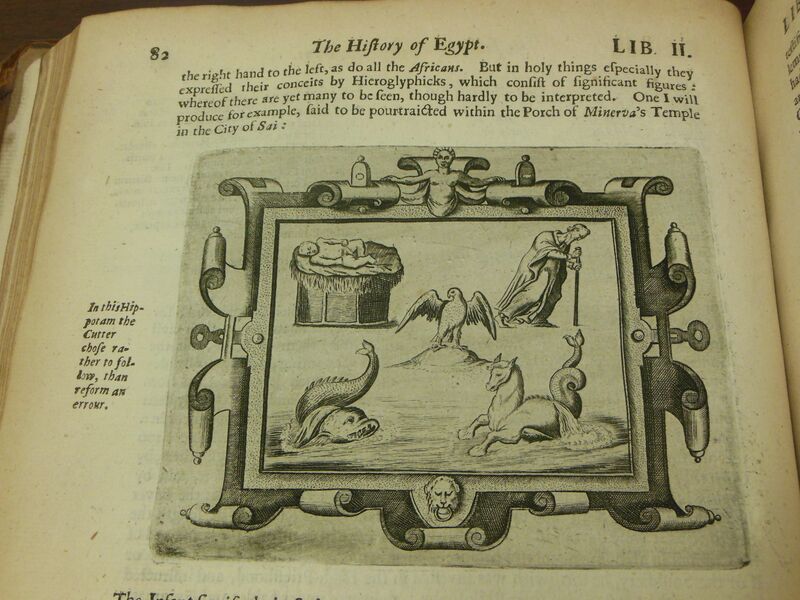 Today’s blog post is about both of these things as they appear in the work of George Sandys, an Englishman who visited Egypt in the seventeenth century and whose book included, among other things, his theories about how hieroglyphs worked. Between the fourth or fifth century A.D., when the use of Egyptian hieroglyphs died out, and the beginning of modern Egyptology in the wake of Napoleon’s expedition there, nobody in the west could read hieroglyphs. That did not stop European travelers and thinkers, however, from trying. Before the discovery of the Rosetta Stone in 1799, most European attempts to read them were based on the premise that hieroglyphs were a symbolic system, where each symbol represented an idea. A hieroglyph of a fish, for instance, might represent a fish, or perhaps the ocean, or the idea of “hatred,” as we’ll see below. If they could just figure out the correspondences for each hieroglyph, they thought, they would unlock the writing system. The key to understanding hieroglyphs, however, is that they are not a purely symbolic system. It’s true that many hieroglyphs are symbols that represent an idea or a word rather than a sound, like Chinese characters do. However, Egyptian hieroglyphs also include phonetic sounds ( is “n”) and determinative characters that provide information like gender or size. These two other types of character threw off European attempts to decode Egyptian hieroglyphs until the Rosetta Stone helped scholars figure it out. Their Letters were invented by Mercury, who writ from the right hand to the left, as do all the Africans. 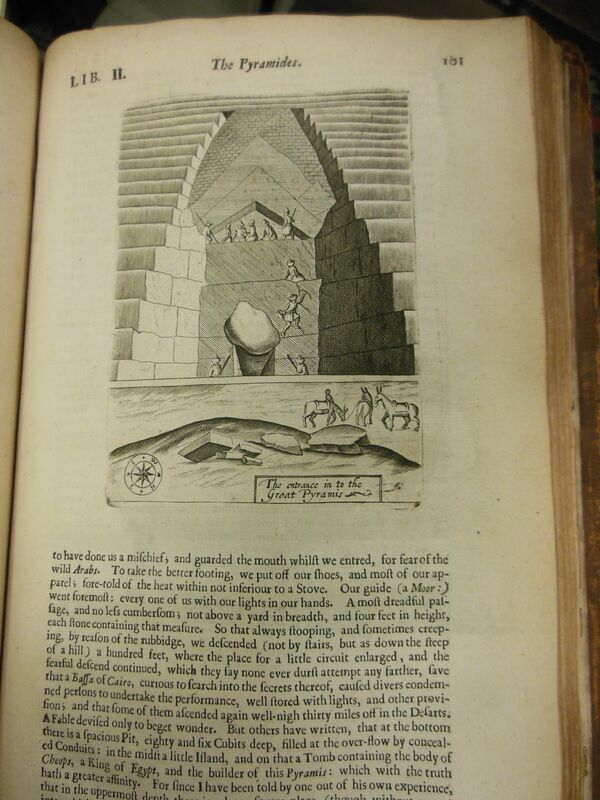 But in holy things especially they expressed their conceits by Hieroglyphicks, which consist of significant figures: whereof there are yet many to be seen, though hardly to be interpreted. The Infant signifieth those that enter into the World, and the Old man those that go out of it, the Falcon, God; the Fish, hatred, because they hated fish that bred in the Sea, which symbolized Typhon; and by the River-horse, murder, impudence, and injustice: for they say that he killeth his Sire, and ravisheth his own Dam, which put together importeth, O you that enter the World, and go out of it; God hateth injustice.